In 1914 Sir Francis Bertie held the plum posting in the British Diplomatic Service—the ambassadorship to Paris. Not only did it carry a yearly salary of £11,500 (the Foreign Secretary was paid just £5,000) but the Ambassador also got to live at the Hôtel de Charost, the grand mansion bought by the Duke of Wellington in 1814 from Napoleon's sister, Pauline Borghese, to serve as the British embassy house. Bertie had been due to retire in 1914 but with the outbreak of war he was confirmed in post for the duration of hostilities. During these years he kept a diary, later edited and published in 1924 by Lady A.G. Lennox. As part of our activities to commemorate the First World War, the FCO Historians have begun tweeting extracts from the diaries 100 years to the day they were first written. This follows on from our successful project to tweet the July Crisis of 1914: @WW1FO. The diaries give a personal insight into the fate of the embassy during the war years, allied relations and wartime diplomacy. This week 100 years ago the German Army was heading towards the French capital and Bertie was full of apprehension: ‘I am burning confidential papers’, he wrote, ‘and preparing to leave at short notice when the Germans seem sure to succeed in occupying Paris’. The French Government was preparing to move south and the embassy would follow: ‘We are very busy packing up…Endless cases containing archives etc filled a big and small furniture van. Such a conglomeration!’ Meanwhile all was not well in the British camp: Lord Kitchener, the Minister for War, had arrived in Paris to meet with Sir John French, commander of the British Expeditionary Force—‘The two Staffs are not working harmoniously’ was his understated assessment of relations. You can follow Sir Francis Bertie on Twitter: @WW1Bertie. 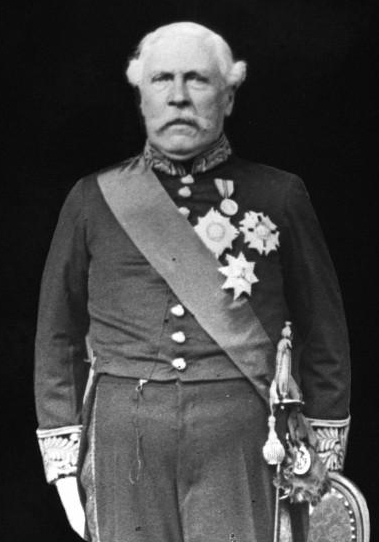 Bertie was a career diplomat, entering the Foreign Office in 1863 and rising to become one of the office's two assistant under-secretaries in 1894. Sensing he had advanced as far as he could in London, he sought a post abroad. He was appointed ambassador to Italy in 1903 and to France in 1905—a post he retained for the next thirteen years. Although he complained in Rome that as ambassador he was ‘only a d—d marionette’, in Paris he was given wide discretion by Sir Edward Grey, the British foreign secretary from 1905 to 1916, in handling relations with France. He helped transform the entente cordiale from a colonial settlement into a close working relationship; a policy he thought to be in the best interests not only of Britain but for Europe as a whole. He encouraged strong British backing for France during the Moroccan Crises of 1905 and 1911 to maintain the balance of power in Europe against an increasingly powerful Germany. Short in temper as well as stature, Bertie was nicknamed ‘the Bull’ by junior staff in Paris. He maintained a high level of pomp and grandeur at the embassy. His wife, Lady Feodorowna Cecilia Wellesley, was the daughter of the first Earl Cowley, the British ambassador at Paris during the reign of Napoleon III. Scrupulous in matters of etiquette, his length of service meant he was the doyen of the diplomatic corps in Paris. Despite being posted at the cultural centre of Europe neither the arts nor literature greatly interested him; he preferred instead the more traditional English pursuits of shooting and fishing. Lord Vansittart, who observed Bertie's robust personality and independence of mind as one of his junior officials, stated he was ‘not only a great ambassador—and therefore troublesome—but the very last of the great ambassadors’. Bertie was raised to the peerage as Baron Bertie of Thame in 1915, but his rise in status was matched by a loss of influence as the embassy was increasingly sidelined by special missions from London, especially the military mission headed by Lord Esher, with whom Bertie eventually came into personal conflict. Follow Bertie on Twitter: @WW1Bertie. The British embassy in Paris celebrates its bicentenary this year. See what they are doing to celebrate the event.